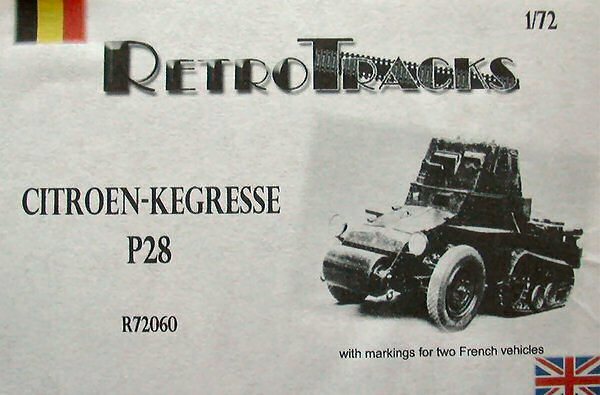 Two pages make up the instructions; the first one explains the history of the vehicle, backed up by two pictures. One image shows a light blue example used by the Uruguayan City Guard in 1933/34. The other one (in black/white) depicts a P28 (licence plate 79706) seen from ¾ of the left rear. The other page contains a drawing showing an exploded view of the model. This image however remains vague concerning the positioning of the pieces, some of them really puny. This is a point that can be ameliorated. Besides the units insignia, the decals also includes the two licences plates. 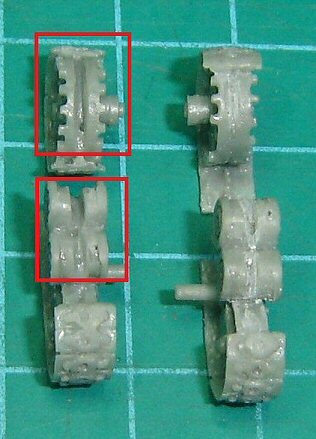 The sprockets, road wheels and idlers are moulded in one piece, together with the majority of the tracks, only the lower track needs to be glued. Numerous corrections were indispensable to give the different parts a sharp look and to get fit them together, because detail often is soft with several imperfections. If you look closely at the pictures and drawings, you’ll notice that the free space between the tracks and the underside of the mudguards should be bigger. To get the correct distance, new holes for the sprocket and road wheels were drilled nearer to the bottom plate (1mm lower) after filling in the original ones. The axles were replaces with longer ones in order to facilitate the positioning of the suspension. Some tracks elements were broken while handling them and carefully needed to be glued back. Two track teeth being absent, these were fashioned with some plastic card. 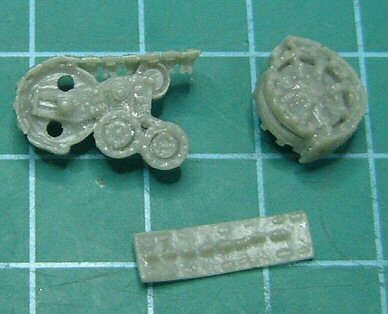 The wheels are nicely reproduced, their tread corresponding with the photos. The hole in the middle were made deeper (from 2 to 3mm), while I replaced their axles with new ones, a tad longer in order to get a stronger fixation. 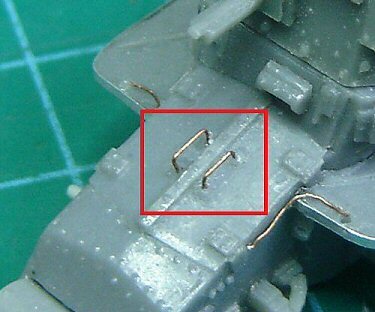 The brake cables, very obvious on the pictures, are scratch built using some copper wire. This part comes moulded in one bloc with the rivets nicely done. The mudguards were thinned from the underside, which also eliminates the numerous imperfections present here. I replaced the handles on all hatches by better ones in copper wire. Visible on this image, I fabricated the power cables for the headlights in very thin copper wire. The lights themselves were drilled out and put on copper supports. A “crown” was made using a slice of a hollowed cylinder having the correct diameter. The interior was painted silver before receiving a drop of Pattex 100% glue without solvent, which is a good simulation of the glass lens. The commander’s hatches are provided as separate parts, allowing a figure to be installed, while the rest of the turret is moulded in one bloc. 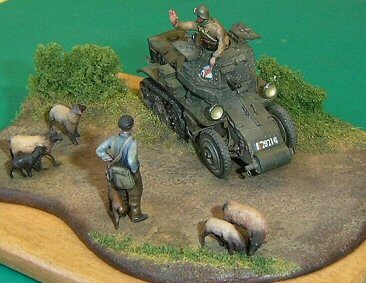 • The vehicle commander was “stolen” from the Somua SAu 40 kit, also from Minitracks. 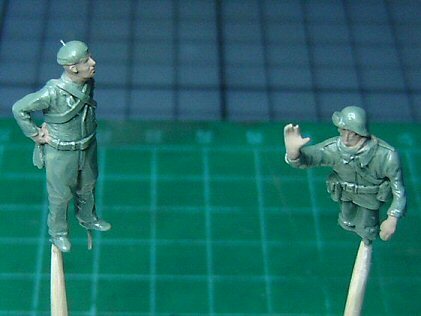 He was reworked using Milliput, his arms came from Preiser and Hasegawa and were adapted to fit the pose. A lot of details were fabricated in Milliput and carefully added to the figure: collar, sweater at the neck, shoulder straps, belt and pistol case. • The shepherd is a modified Preiser guy, bag and belts again made in Milliput. The bonnet he wears is also fabricated that way, except for the little “excrescence" which is a bit of fine copper wire. His dog also comes from Preiser, while the sheep are Faller 1/87 (#154001). 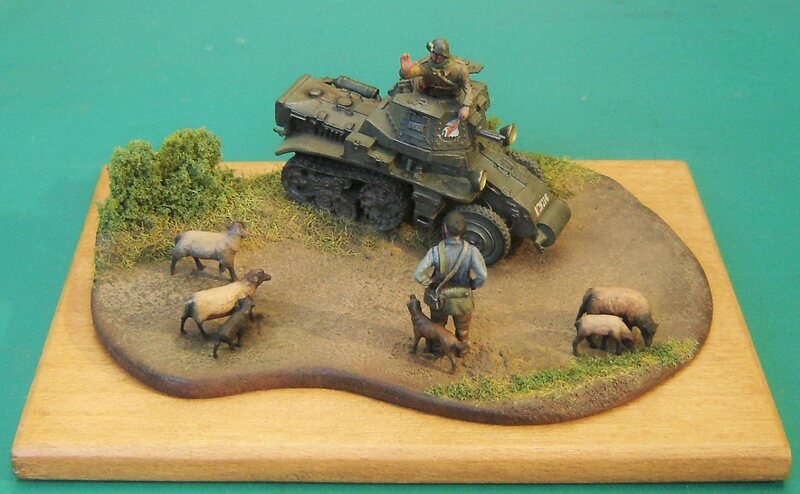 Notwithstanding the scale difference, they are perfect for this vignette.